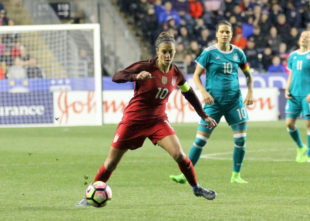 After scoring her 99th and 100th career goals as a U.S. international, Carli Lloyd is PSP’s Player of the Week. The goal that hit the mark wasn’t a thing of beauty, but it was most certainly one of industry, with Lloyd playing a role in the buildup and then cleaning up the mess. This marks the third time Lloyd has been PSP’s Player of the Week, the first since her practically legendary hat trick in the World Cup final in 2015. Good write-up, Dan. Way to go Carli! My favorite game besides her wc vs Japan was a year before that against China. She had scored twice than took a nasty smack to the face going for a header. Blood gushed from her nose She had it taped up and went right back on the field.